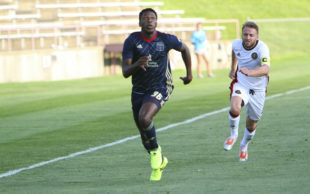 Just two weeks since signing with Bethlehem Steel FC, striker Faris Pemi Moumbagna – who goes by the Prince-like mononym Faris – notched his first-ever professional goal and assist in the team’s 4-1 road victory over Atlanta United II. Faris hails from Yaounde, Cameroon, but previously played his youth ball at the Soccer Institute at Monteverde Academy (SIMA) just outside of Orlando, Florida. Faris’ run at SIMA was a massive success, including a brace in the Academy’s astonishing 4-3 victory over Argentinian powerhouse River Plate’s first team (!). While Bethlehem Steel is Faris’ first professional club, the 18-year-old forward has represented Cameroon’s Indomitable Lions at the U-20 level, including in the country’s recent successful run to qualify for the U-20 African Cup of Nations. Faris also previously trained with MLS outfit Minnesota United. On Saturday, Faris showed why he deserved a pro contract as a teenager. After coming in as a second-half substitute, a fierce and relentless drive by Prosper Chiluya led to the ball falling in front of Faris in Atlanta’s box. The striker made no mistake about it and latched on to the ball with his left foot for a blistering volley to put the game firmly out of reach at 3-1 in the 71st minute. Faris wasn’t done, though. Less than a minute later, Faris drove past a defender to the Atlanta end line before finding the Union Academy’s star No. 10 and fellow teenager Brenden Aaronson at the penalty spot for another goal. With just one starting striker spot up for grabs and Fabian Herbers seeing time on Philadelphia Union’s bench, Faris is battling 2018 Union draftee Aiden Apodaca (who, it also should be noted, also notched his first professional goal in the match) for minutes. After having an immediate impact in his first three Bethlehem Steel appearances – and his obvious chemistry with Aaronson – Faris will likely earn more minutes and even a starting role as the Steel make another playoff push this season.